Madrid, capital of Spain, is located in the Meseta Central a plateau at about 700 meters above sea level and here, at Christmas, the snow is not uncommon. Madrid boasts the most beautiful Christmas market in Spain, that of the Plaza Mayor, which is probably also the oldest in the country, in fact dates back to the mid-nineteenth century. 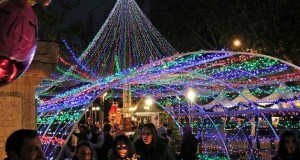 The city has many other Christmas markets and other attractions during the Christmas holiday season. Several, for example, are the exhibitions of cribs from all over the world. 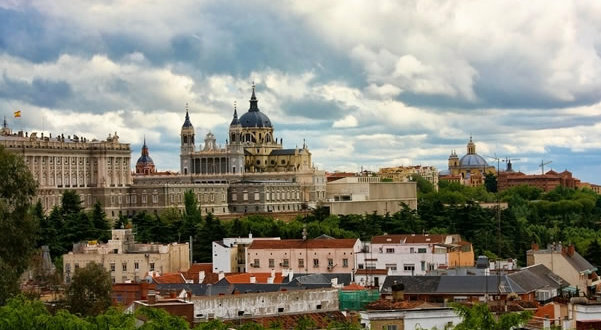 Special attractions for children are organized in the Parque del Retiro as well as the Explanada del puente del Rey. 1) Christmas market in Plaza Mayor (Mercado de Navidad de Plaza Mayor). The main Christmas market in Madrid takes place in what is probably the most beautiful square of the city. The market stalls – a total of 104 log cabins, 90 of which offer traditional Christmas products and 14 items for entertainment – expose all sorts of objects related to Christmas: from the statues of the nativity, to the Christmas tree decorations, but here you will find also crafts. Opening: from late November to late December 2018. Opening Hours: Monday to Friday from 10.00 to 21.00; Saturday and Sunday from 10.00 to 22.00. 2) Christmas market Paseo de Recoletos (Feria Mercado de Artesanía de la Comunidad de Madrid). This fair of Madrid has become an important showcase for the production of handmade gift items of the Community of Madrid and Spain. The fair is renowned for the quality and variety of its products, which are guaranteed by the presence of many renowned artisans. Participants included 200 workshops from all over Spain. There are potters, jewelers, leather workers, carvers, jewelers, fabric decorators, manufacturers of toys, glass, etc. Opening: 1 December – 30 December 2018. Opening Hours: every day from 11.00 to 21.00. On 24 and 31 December, the market closes at 15.00. On December 25 and January 1, the market is closed. 3) Feria de Antigüedades, Galerías de Arte y Coleccionismo – Almoneda Navidad. This exhibition dedicated to antiques, works of art and collectibles takes place in the pavilions (pabellón 5) of the Madrid Fair (Feria de Madrid). The fair will be attended by about 85 auction houses, antique shops and galleries. Opening: 12 December – 16 December 2018. Opening Hours: from 12.00 to 21.00. 4) El Rastro de Madrid. 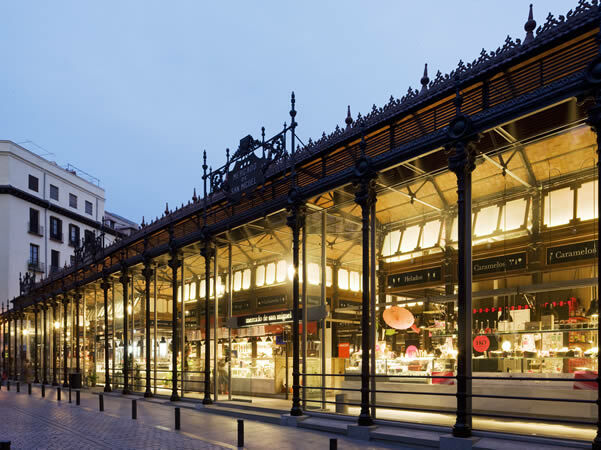 This is the most famous open-air market in Madrid and one of the places to visit during your stay in Madrid. Consisting of more than 1,000 stalls of vendors and traders, in this market you can find everything. El Rastro is located along the Plaza de Cascorro and Ribera de Curtidores, between Calle Embajadores and Ronda de Toledo (just south of La Latina metro station). Metro: Line 5: Latina y Puerta de Toledo. Line 1: Tirso de Molina. Line 3: Embajadores. Opening: Annual market. Opening Hours: Sundays and public holidays from 9.00 to 15.00. 5) Market of San Miguel (Mercado de San Miguel). 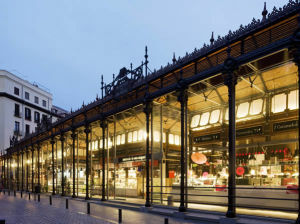 The Mercado de San Miguel is set in a historic listed building situated on the Plaza San Miguel, where in addition to traditional market food products such as meat, fruit, fish you can find many products related to Christmas both to prepare meals or family dinners and to decorate the house. 6) Market of San Antón (Mercado de San Antón). This market is located in Calle Augusto Figueroa consists of a traditional market – where you can buy fruit, meat, fish and other food products – and restaurants and delis. During Christmas you will find the traditional Spanish Christmas cuisine. Opening: Annual market. Opening Hours: Monday to Saturday from 10.00 to 22.00. Sunday: from 10.00 to 15.00. 7) Market of La Paz (Mercado de La Paz). In the heart of the Salamanca district of Madrid, the market of La Paz, with its stalls and friendly atmosphere, is a great place to purchase Christmas gifts. The market offers to the visitors a wide range of high quality products. Opening: Annual market. Opening Hours: Monday to Friday from 9.00 to 14.30 and from 17.00 to 20.00. Saturday from 9.00 to 14.30. 8) Market of Chamartín (Mercado de Chamartín). This market is located in the barrio of Hispanoamérica, not far from the stadium Santiago Bernabeu. The market has a great gastronomic offer, but there are also gift items, gifts, crafts and flowers. Opening: Annual market. Opening Hours: Monday to Friday from 9.00 to 14.00 and from 17.00 to 20.00. Saturday from 9.00 to 14.00. 9) Flower Market of Tirso de Molina square (Mercado de flores de Tirso de Molina). Located in the center of Madrid, close to Plaza Mayor, for those who love plants this is the place to visit during the Christmas holidays. 10) Market of object for jokes of the Plaza de la Provincia (Mercadillo de artículos de broma de la Plaza de la Provincia). This market takes place in the Plaza de la Provincia, near Plaza Mayor, is the ideal place for those who love the jokes and fun, there are indeed objects for jokes for everyone: firecrackers, stink bombs, powder sneezing, fake ink, wigs. Opening Hours: from 10.00 to 22.00. Other small Christmas markets are usually held in many other places and squares of the city: Plaza de Santa María Soledad Torres Acosta, Plaza de Callao, Plaza del Carmen, Plaza de Santo Domingo, Calle Ibiza (near the Parque del Retiro de Madrid), Plaza de Moncloa, Plaza de Jacinto Benavente.